Health related quality of life is a complex outcome measure increasing used in clinical trials and quality of care research. 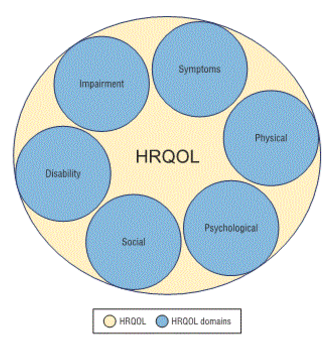 HRQOL ideally incorporates multiple domains, generally from the patient’s own perspective by assessing health status and maladies such as impairment, symptoms or disability. Recently I was reading a study on how heart patients need to adhere to their stack at a level of 80% (time and dosage) otherwise they could risk hospitalization again, and followed that with another study where: when a symptom diary is provided a patient is more likely to survive, and survive much longer. So it cannot be argued that having a adherence tool attached to a symptom tracker is effective in helping people manage their health, it is a matter of how effective and how to get more people to use it, which is the situation we find ourself in. A quick study on why it is important to track your HRQOL (with ODL’s – observations of daily living, Medical Outcomes Study Short Forms (SF-12 and SF-36), the Sickness Impact Profile, and the Quality of Well-Being Scale). Patients with heart failure must monitor for and recognize escalating symptoms to take action to relieve symptoms and decrease hospitalizations. One way to promote patients’ engagement in symptom monitoring is by providing a symptom diary. The intervention group had longer event-free survival than the usual-care group (P = .03). There were no differences in changes in HRQOL scores between the groups over 3 months. With TMS acting as en entire Personal Health Manager (series of Records) Consider the distinction this way: the traditional health record and the EHR revolve around data collected at (and important to) the clinical time period. But people don’t live from clinical episode to clinical episode – and health-related information, such as whether one’s stress is elevated due to family or work pressures or whether one’s chronic pain spikes with a sudden change in temperature (which would never make it into a traditional health record), are just as important to many people as standard clinical data are to providers. This patient-originated data presents the opportunity to create a fuller picture of health – both individually, so patients can look at analyses of their own trend information, and in the aggregate, so patients can compare their symptoms with those of other patients with similar disease and condition. 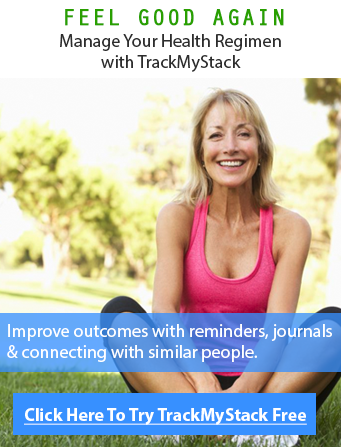 TrackMyStack inherently provides an open community which let’s anyone view any treatment undertaken by patients or people with health goals. These of course can be recorded and managed privately, but by default everything is shared by being open, as it can provide support or ideas for a treatment that may benefit a patient in ways they may not have been aware of.